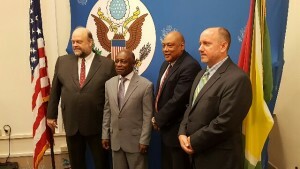 LEFT TO RIGHT: American Ambassador, Perry Holloway; Foreign Minister Carl Greenidge; Natural Resources Minister Raphael Trotman , and Carter Centre Country Representative, Jason Calder. The United States (US) is injecting US $297,000 is injecting in helping Guyana to prepare to become a member of the Extractive Industries Transparency Initiative (EITI) and ensure good governance. American Ambassador to Guyana, Perry Holloway said the 12 month project by thr Carter Centre is aimed at advancing transparency and accountability by assisting Guyana to develop its EITI candidacy documents. “I am confident this program will strengthen the work of the Government of Guyana in promoting transparency in the country’s extractive industries at a time when Guyana prepares to welcome future growth in the petroleum industry,” he said. The EITI is not confined to the management of oil revenues, but encompasses the spending and allocation of earnings from other extractive industries. Carter Centre Country Representative, Jason Calder said the project is aimed at building capacity, reviewing laws and regulations and working with the Multi-Stakeholder Group. He emphasised that the Multi-Stakeholder process involving civil society, private sector and government is aimed at fostering good governance, accountability and transparency. “Central to such a strategy are tge systems for inclusive governance, transparency as and accountability. This has not been the reality in many countries syrickeb with the “resource curse,” something we are certain Guyanese want to avoid,” Calder said. Under the EITI, Guyana is required to produce an annual repirt in various types of extractive sector revenues paid by companies to the government are reconciled with those that government reports reveivinf. EITI reports also examine revenue allocations, inter-governmental transfers, company social expenditures, the process for allocating licenses and contracts, identifying the beneficial owners of companies in the extractive sector, and documenting the impact of the extractive industries on the economy. The Carter Centre’s Country Representative says over the years it has built up a wealth of experience on transparency and Access to Information in more than 17 countries and on long-term mining sector transparency in the Democratic Republic of Congo (DRC). “In DRC we have supported the Multi Stakehokder Group that oversees the EITI process tgere and worked with civil society groups from the national to the grassroots levels to promote transparency and accountability in the mining sector,” he said.